I've used the starfish story for years and it always makes me smile. I'm glad you're speaking with parents. It has to be so overwhelming at diagnosis. I also struggle with the idea of being an advocate, but if we can make a difference to just one person, we've made a difference. 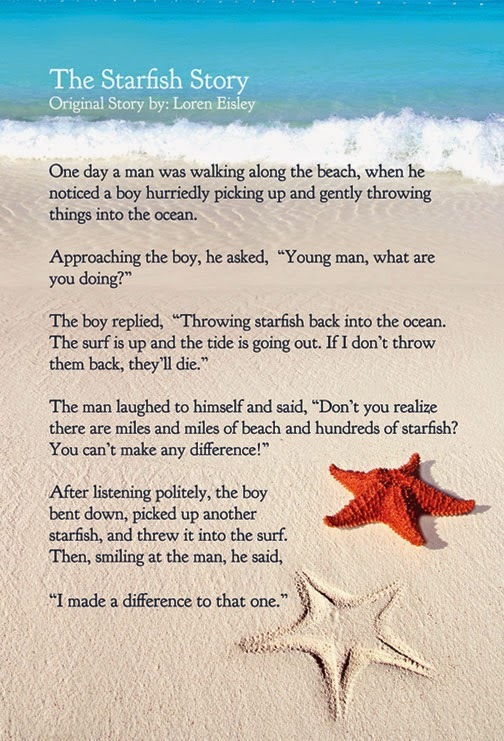 You are definitely making a difference, and great starfish story. That's so amazing that once a month you go talk to newly diagnosed patients. I would love to know how you got started with that. I've never heard the starfish story either so thanks for sharing :). I can't believe I've never heard of that starfish story before. That is perfect! You are right that what seems "little" to us can be "big" to someone else. Keep at it. Thank you! This makes a difference. A BIG difference! Those first early weeks after diagnosis are awful. What you are doing helps! What you are doing is huge. I'm sure every one of those families would say the same thing. That is HUGE! What you are doing is huge. How happy--JOYFUL--I would have been to have met you at a newcomers-ish kind of meeting. You were the first blog I found and reading through and seeing the journey you have had and the success helped me so much with Carter. You are inspiring and I am so happy to hear you are helping others in the capacity that you are. I would have loved to have heard some of this before leaving the hospital. You have such a big heart for the parents of T1's may you be blessed a thousand fold! Wow. I love that story. I had never heard it before. Thank-you for sharing. Okay, I didn't use the word "advocate" in the topic for today until the very end because I do think is kind of scares people off. But it shouldn't. You are absolutely and advocate. You are changing people's lives. And I honestly believe that often those seemingly small, one-on-one connections are more meaningful and more powerful than a sweeping national campaign. Thank you for all you do!